Sew Useful Designs: All Puffed out! Well, I have now completed the top of my Puff quilt - Yay! After I chat with you I am going to baste the three layers of the fabric sandwich together and get stuck into some quilting :-) I am told that practice makes perfect, and every aspiring quilter has to start somewhere... and for me, this is it! I have also been busy sewing on some other projects, but I can't show you them yet as they are for swaps. What a tease, eh? But what I can share with you are these soft & cozy woollens and tweeds that I purchased yesterday from my local patchwork store. I am gradually gathering woolly scraps so that I have enough variety to make one of these. Jodie over at Ric-Rac did a post about Mimi at Doll a few weeks back, and I checked out the link and spent a happy few hours ooh-ing and aah-ing over these cute Tiny Worlds! I hope that you are all enjoying a great weekend! Wow Vikki.... puff turned out great - I knew it would!! Love, love, love the tiny world pin cushion. I expect to see show and tell on Tuesday night. Puff looks amazing Vikki and those little things are sooo cute. I just love the new wools that are out now but I can't possibly get into anything else right now. I started doing some crochet tonight - help!! Your Puff the magic dragon is lovely! I love the fabrics you used for it. 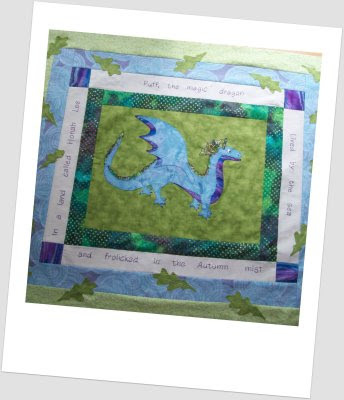 Puff the dragon quilt has come together very nicely. Have fun basting and quilting your quilt together. Like everyone else, I also like the woollen pin cushion. 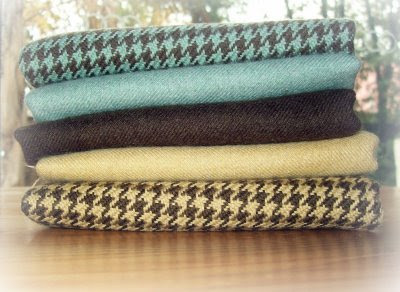 The fabrics you've chosen will look great. Wow Vikki , Puff is looking extra good! Gorgeous stack of wools. I bought one almost identical to the top one in your stack. What a fantastic dragon. New Xmas BOM and Giveaway! Tozz's Tulips - I'm a winner!